September 1st, 2014. Coaches Across Continents’ unique WISER monitoring and evaluation (M&E) provides a detailed picture of what is happening on the ground. Not only does our M&E measure the outcomes of our On-Field programs, it also gives us valuable insights into the impact CAC is having year-round in local communities across the globe. Accounting for the successes and challenges unique to each partner program allows us to continuously improve the quality of our programs and systems. Our team has just finished a half-year review of our On-Field programs. In 2014, CAC has piloted many initiatives, including training in M&E and child protection and our finalized Hat-Trick curriculum. Here is what our monitoring and evaluation is telling us. So far, CAC has conducted 42 trainings for 38 implementing partner programs in 2014, reaching 1,859 coaches who will in turn impact 132,375 youth in their respective communities. CAC strives to build strong, collaborative partnerships to achieve sustainability by creating local networks of football for social impact leaders around the world. As a result, the number of local member partners CAC works with has considerably increased: since the beginning of 2014, CAC has empowered 685 community partners, five times more than in 2013. 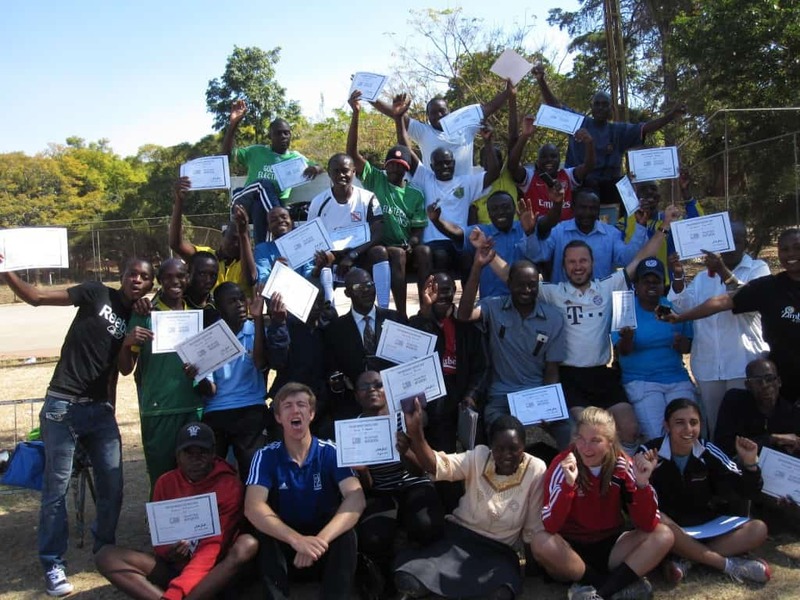 Our programs connect like-minded educators who can serve as a resource to one another: local coaches in Zimbabwe created a Facebook group to keep in touch, coaches in Tanzania planned weekly meetings, and a committee was set up in Zambia to oversee the implementation of CAC’s 24-week curriculum. In addition to developing a football resource packet for Peace One Day to be played in over 130 countries leading up to September 21st, CAC launched its improved Hat-Trick curriculum in January, based on our ‘Chance to Choice’ philosophy. The curriculum is composed of more than 180 games, including a new child rights module bringing to life the UNICEF Convention on the Rights of the Child. The curriculum allows for even more flexibility to fit the distinctive social needs of each community. 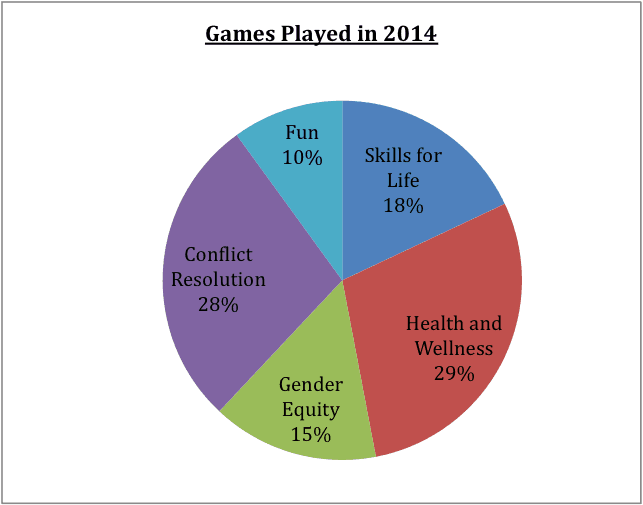 In total, more than 120 different games, linked to 36 different role models, have been played in 2014. 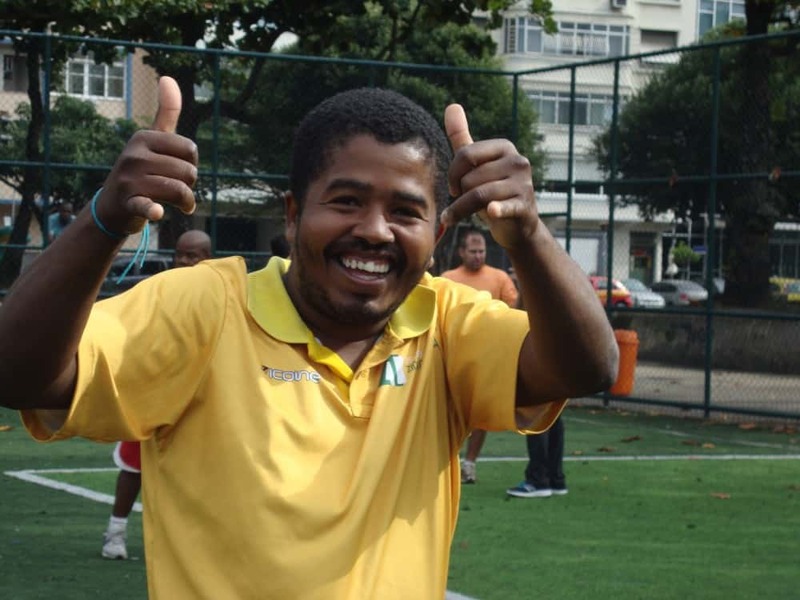 CAC is particularly successful in training local coaches and organizations in using football for social impact. 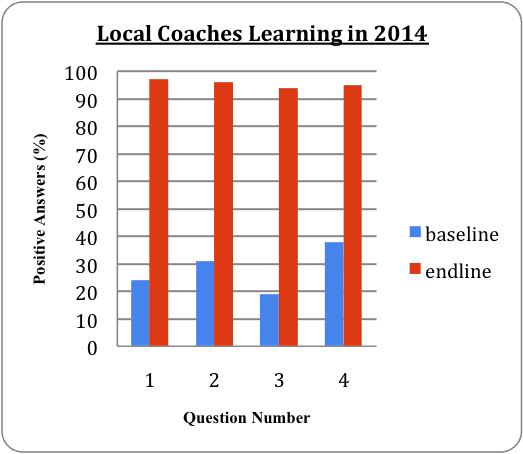 For instance, 97% of all local coaches now know a football game to teach children to find creative solutions to their problems instead of asking for the answer, compared to 24% prior to 2014. Health and Wellness is an important component of our curriculum. This includes many HIV behavior change games,and 95% of local coaches trained know a football game to teach children about how to protect themselves against sexually transmitted diseases, compared to only 31% of coaches who had never attended a CAC training. Returning coaches have noticed an improvement in their players’ overall health and their awareness of the importance of taking care of their bodies following the implementation of CAC games throughout the year. CAC places an important emphasis on female empowerment and female participation in sports. Out of the 36 role models used On-Field, 25 were female, giving more than 90% of local coaches the tools to teach children about powerful female role models. Games directly addressing female empowerment and women’s roles in society have lead to numerous discussions around the world about the root causes of inequality, traditional roles of women and men, ways of integrating women and girls in the community, or the importance of female participation in sports. This has led to increased female participation, with 70% of local coaches planning on integrating girls in their teams, double the amount at the beginning of the year. Brazil clubs have expressed their desire to add girls to their trainings, and other groups have created girls specific afterschool groups, teams, and leagues. In Zanzibar participants brainstormed five solutions they could implement to give more power to women in their community after playing one of CAC’s gender equity games. A few impacts of our conflict resolution and social inclusion games include local coaches engaging in discussions concerning homosexuality and in identifying solutions to tackle widespread corruption. Our Peace Day games have been launched in many communities affected by a long history of conflict and violence such as the DRC and Rwanda. A game between a deaf and an able-bodied team was organized at the end of our program in Sierra Leone that focused largely on integrating people with disabilities; an unprecedented event according to our partner program. Do you know a football game to teach young people to find creative solutions to their problems, both as a team and individually, instead of asking for the answer? Do you know a football game to teach young people how to protect themselves from sexually transmitted infections, including HIV/AIDS? Do you know a football game to teach young people about the role and place of women and girls on the soccer field, at home and in the community? Do you know a football game to teach young people how best to resolve conflict? 100% of our participants have received training in child protection and have promised to “ALWAYS protect and NEVER abuse children and young people in their care”, now mandatory to receive a CAC certificate.Only 14% said they had received child protection training before being involved with CAC. In Kitale, Kenya, 150 children learned their rights for the first time and spoke up about child abuse in their community. Child rights games have been played at 50% of our programs and inspired local coaches to invent new games teaching children about their rights. CAC also keeps track of our partners’ progress towards Self-Directed Learning. One third of coaches participating in a CAC program this year had already attended another CAC training a previous year. This is crucial to develop local ownership and self-sufficiency. In spite of 64% of our 2014 programs entering the first year of the partnership, 47% of them are in the adapt or create stages of Self-Directed Learning, whereby they not only understand the concept of sport for social impact but are also capable of adapting or inventing games to address new social issues. Participants all around the world have developed their own football for social impact curriculum. Themes include child rights that address regional laws, deforestation, combating HIV stigma, cholera, malaria, wealth redistribution and maternal mortality. CAC has also been active Off-Field, speaking at high-level events in India, Qatar, San Francisco and New York on a wide range of topics including CSR policy for football development, sport for development, youth development and empowering girls through sports. In 2014, CAC launched a new corporate partnership with Chevrolet, which has already had tremendous success with projects benefiting our local partners Rumah Cemara in Bandung, Indonesia and Beyond the Ball in Chicago, USA. The CAC team has also put our writing skills to the test, and our paper on CAC’s Self-Directed Learning model was accepted for publication in a special issue of Soccer & Society. To end the first half of 2014 on a high note, CAC has been shortlisted for the 2014 Beyond Sport Awards for the highly competitive Corporate of the Year category.